French Napoleon III cotton velvet cushion in smart stripes of blue, brown and yellow. Self-backed and slip-stitched closed with a duck feather cushion pad. Beautiful late 19th century black field tablecloth with embroidery with silk on wool. 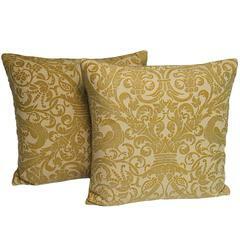 Pair of handmade yellow cotton and velvet pillows with a rope trim. The pattern, depicting birds and floral motifs, is based on a 17th century French design. 100% goose down filling.